Click on the links to find out about plant needs, uses, functions, ecological relationships and more. Acknowledgement and gratitude to Ken Fern for establishing the excellent plants for a future database that we have used extensively both for rearing and caring for the plants we grow and for creating our plant profiles. 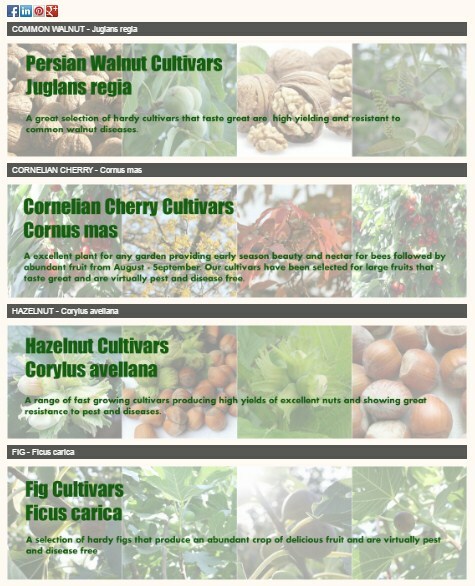 Click here for our range of pest and disease resistant fruit and nut cultivars ideal for natural gardens. Disclaimer: To the best of our knowledge all the information contained in our pages is accurate, however we cannot accept responsibility for any adverse affects that any person or animal may suffer as a result of information used in these pages. Please take time to research a plant thoroughly before using. If you don't see your country below send us an email for a delivery quote. The above table is provided as a guide and actual delivery prices may differ depending on the plants ordered and the precise location you would like the plants sent to. The courier service is tracked and recorded with a signature needed on receipt of the plants. Delivery is estimated to take between 5-7 days. We accept payments in British Pound, Euro and Bulgarian Leva via Bank transfer and PayPal. email balkanecologyproject@gmail.com with your order. For larger orders or to countries outside of Europe send us an email and we will get back to you. N.B - USA and Australia maintain import restrictions regarding seeds and plants. Please be aware of any phytosanitary regulations in your area and act accordingly. Please send an email to balkanecologyproject@gmail.com with your order.